The Harriet Hat is a slouchy, beret-style hat that can also be worn as a snood. 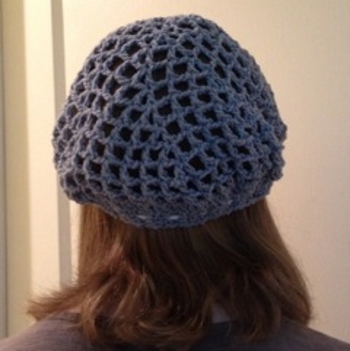 Worked in the round in a simple mesh, it’s quick to finish so you can be wearing it in no time! If desired, a ribbon can be substituted for the drawstring. Size: The hat fits an average adult head, but the drawstring makes it fit any size. If you have a very large head, bump up the crochet hook to J (6.00mm) to get a better fit. Notes: The hat is worked in joined rounds from the top down. Then the drawstring is made and threaded through the holes in the band. 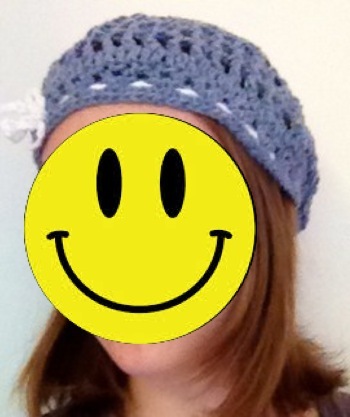 An easy double crochet mesh pattern is used. It’s a quick and simple way to add some style, and if desired, a ribbon can be substituted for the drawstring. Rnd 1: Make a magic ring, ch 4 (counts as dc and ch-2 here and throughout.) *Dc in ring, ch 2* 5 times. Sl st to 2nd ch of beg ch-4. Rnd 2: Ch 4 , dc in same st. *Ch 2, (dc, ch 2, dc) in next dc* around; ch 2, sl st to 2nd ch of beg ch-4. Rnd 3: Ch 4, (dc, ch 2, dc) in next dc, ch 2, *dc in next dc, ch 2, (dc, ch 2, dc) in next dc, ch 2* 5 times, sl st to 2nd ch of beg ch-4. Rnd 4: Ch 4, dc in next dc, ch 2, (dc, ch 2, dc) in next dc, ch 2, *(dc in next dc, ch 2) twice, (dc, ch 2, dc) in next dc, ch 2* 5 times, sl st to 2nd ch of beg ch-4. Rnd 5: Ch 4, (dc in next dc, ch 2) twice, (dc, ch 2, dc) in next dc, ch 2, *(dc in next dc, ch 2) three times, (dc, ch 2, dc) in next dc, ch 2* 5 times, sl st to 2nd ch of beg ch-4. Rnd 6: Ch 4, (dc in next dc, ch 2) three times, (dc, ch 2, dc) in next dc, ch 2, *(dc in next dc, ch 2) four times, (dc, ch 2, dc) in next dc, ch 2* 5 times, sl st to 2nd ch of beg ch-4. Rnd 7: Ch 4, (dc in next dc, ch 2) four times, (dc, ch 2, dc) in next dc, ch 2, *(dc in next dc, ch 2) five times, (dc, ch 2, dc) in next dc, ch 2* 5 times, sl st to 2nd ch of beg ch-4. Rnd 8: Ch 4, (dc in next dc, ch 2) five times, (dc, ch 2, dc) in next dc, ch 2, *(dc in next dc, ch 2) six times, (dc, ch 2, dc) in next dc, ch 2* 5 times, sl st to 2nd ch of beg ch-4. Rnds 9-10: Ch 4, (dc in next dc, ch 2) around, sl st to 2nd ch of beg ch-4. Rnd 11: Sl st into 1st ch-2 sp, ch 2, 1 dc in same sp. (2 dc) in each ch 2 sp around. Sl st to 2nd ch of beg ch-2. Rnd 12: Do not ch. *sc in next st, ch 1, sk 1* around. Do not join, but skip the 1st sc and sc in the ch-1 sp from the start of the round. Place a stitch marker here to mark the start. Continue in a spiral. Rnds 13-15: (3 rounds): *ch 1, sk next sc, sc in next ch-1 sp* around. At the end of round 15, sl st into the next ch-1 sp and fasten off. Weave in yarn ends. Using a contrasting color, make a chain long enough to wrap around your head the way you would wear a hat. Then add about 6 inches. Fasten off. 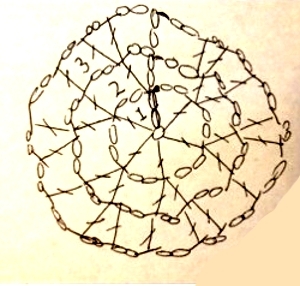 Weave the drawstring through the chain spaces of Round 14, leaving three inches at either end. Pull the drawstring until the hat fits you properly, then tie the ends in a square knot. Finally, tie the ends in a bow. 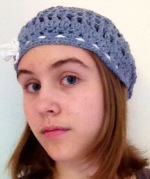 I’m 15 years old and have been crocheting for 2 years. I’ve been designing my own patterns ever since I learned to crochet, and to date I’ve published about 30 free patterns. I mainly make small items like hats, scarves, and amigurumi, and I’m a bit of a yarn hoarder – I have a large bucket of yarn in my bedroom. You can look me up on Ravelry to view my designs, or visit my blog. Pattern & images © Claire G. All rights reserved. Claire, Congratulations!! I am so very glad you like to crochet, and that you are talented enough to design, both at such a young age and after only two years. I actually learned a little bit about crochet when I was about 8, but never did much with it until after my second child was born. Then, I put it aside and went back to work. However, after I retired to the country 5 1/2 years ago, I’m crocheting again. My best at designing is doilies. I’m not that talented, and I do have trouble with some patterns, still. I will keep on keeping on and I hope you do too. I just finished making this last night in time to mail it to my daughter for her 20th BD which is next week. Your pattern was wonderful and so easy to read. It came out looking so cute even my OTHER daughter liked it, and she doesn’t l like anything. I may secretly make one for her, too. Thanks so much and I hope to see many more of your patterns.